To isolate melanoma Ags recognized by T cells, cDNA libraries made from melanoma cell lines were screened with four CTLs derived from tumor infiltrating lymphocytes (TIL) that were able to recognize melanoma cells in a HLA-A1, -A2, or -A3 restricted manner. Although cDNAs encoding the previously identified melanoma Ags, tyrosinase and gp100, were isolated, these TIL were found to recognize previously unidentified peptides. An HLA-A1-restricted CTL, TIL1388, was found to recognize a tyrosinase peptide (SSDYVIPIGTY), and an HLA-A3-restricted CTL, TIL1351, recognized a gp100 peptide (LIYRRRLMK). CTL clones isolated from the HLA-A2-restricted TIL1383 recognized a gp100 peptide (RLMKQDFSV). HLA-A2-restricted CTL, TIL1200, recognized a gp100 peptide (RLPRIFCSC). Replacement of either cysteine residue with α-amino butyric acid in the gp100 peptide, RLPRIFCSC, enhanced CTL recognition, suggesting that the peptide epitope naturally presented on the tumor cell surface may contain reduced cysteine residues. Oxidation of these cysteines might have occurred during the course of the synthesis or pulsing of the peptide in culture. These modifications may have important implications for the development of efficient peptide-based vaccines. These newly identified peptide epitopes can extend the ability to perform immunotherapy using synthetic peptides to a broader population of patients, especially those expressing HLA-A1 or HLA-A3 for whom only a few melanoma epitopes have previously been identified. Melanoma is a relatively immunogenic tumor, and T lymphocytes appear to be important in mediating in vivo melanoma regression. In the past several years, extensive efforts to identify target molecules for these melanoma reactive T cells have resulted in the identification of more than 10 Ags. These can be classified as melanosomal proteins (tyrosinase, MART-1/Melan-A, gp100, TRP1, TRP2), proteins expressed in testis and a variety of cancers (MAGE1, 3, BAGE, GAGE, NY-ESO-I), and others (p15, GnT-V, PRAME) (1, 2, 3). Melanosomal proteins appear to be particularly immunogenic Ags, since tumor infiltrating lymphocytes (TIL)3 that recognize these Ags have been isolated from many melanoma patients (4, 5, 6, 7, 8, 9, 10, 11, 12, 13, 14). Further, immunization with peptide epitopes from these Ags can induce tumor-reactive T cells in patients and lead to cancer regression (15, 16, 17). These epitopes can be recognized by T cells in the context of a variety of HLA alleles, including HLA-A1, -A2, -A3, -A24, -A31, -A33, -B44, -B45 and -DR4 (6, 8, 9, 10, 11, 14, 18, 19, 20, 21, 22, 23, 24, 25, 26). However, only a limited number of epitopes have previously been identified for most HLA alleles. To develop peptide-based immunotherapies for a wide range of patients expressing various HLA types, it is important to identify epitopes from known Ags presented by various HLA alleles, especially by the frequently expressed HLA molecules, HLA-A1, -A2, and -A3. In this study, four melanoma-reactive CTL that were derived from TIL were able to recognize melanoma cells in the context of frequently expressed HLA-A molecules in the Caucasian population, including HLA-A1, -A2, and -A3, and were used for the isolation of melanoma Ags. The isolated Ags were found to be tyrosinase and gp100, both of which were previously identified as melanoma Ags recognized by CTL. However, all of the epitopes identified in this study were previously unidentified peptides. These peptides can extend the use of peptide based immunotherapies to a broader population of patients with melanoma. One of the newly identified gp100 epitopes contained two cysteine residues, and results suggested that oxidation of cysteines on the synthetic peptide may occur in vitro. An additional report has also recently identified a cysteine-containing peptide as the target of tyrosinase-reactive T cells (18). These results imply that modification of cysteine-containing peptides may enhance the in vitro as well as their in vivo immunogenicity. T cells were expanded from TIL in medium containing 6000 IU/ml of IL-2 (Cetus-Oncology Division, Chiron, Emeryville, CA) for 30–50 days as previously described (27, 28, 29). TIL1388 was generated from an axillary lymph node metastasis of a 45-year-old female who did not respond to treatment with chemotherapy (dacarbazine, cisplatin, and tamoxifen) plus TIL and IL-2. Subcultures of TIL1388 were expanded as previously reported (30). Briefly, TIL were stimulated in 0.2 ml RPMI 1640 medium containing 10% human serum, 30 ng/ml OKT3 mAb, 50,000 allogeneic PBMC that had been irradiated with 30 Gy and 10,000 allogeneic EBV-transformed B cells (EBV-B) that had been irradiated with 120 Gy. The following day 120 IU/ml IL-2 was added. TIL1351 was generated from an inguinal lymph node metastasis of a 39 year old female who experienced a partial response to treatment with chemotherapy (dacarbazine, cisplatin and tamoxifen) plus TIL and IL-2. TIL1383 clones were generated from the left iliac tumor of a 33-year-old female who also experienced a partial response to treatment with chemotherapy (DTIC, cisplatin and tamoxifen) plus TIL and IL-2. A single cell suspension from this patient’s tumor was plated in 24-well dishes in RPMI + 10% human serum at 106 cells/well with 120 IU of IL-2. One week later 1.5 × 105 HLA-A2 matched allogeneic melanoma cells were added to each well along with 2 × 106 autologous PBMC that had been irradiated with 30 Gy. After a total of four stimulations with allogeneic HLA-A2 matched melanoma cells, T cell clones were isolated by limiting dilution at 2 cells/well and expanded using OKT3, as described above. TIL1200 was generated from the metastasis of a 29-year-old male who experienced a partial response to treatment with TIL and IL-2 (7). cDNA libraries were constructed from melanoma cell lines, Skmel23 and 888mel, in the VR1012 vector that was kindly provided by Chiron/Viagene (San Diego, CA). The multiple cloning site was modified in this vector to contain EcoRI and HindIII restriction sites following destruction of a HindIII site in the vector backbone conducted using site directed mutagenesis. Poly(A)+ mRNA was isolated from the Skmel23 and 888mel melanoma cell lines using an oligo(dT) column and cDNA libraries were prepared using directional random primers (Novagen, Madison, WI). Briefly, random primers containing two T residues at the 5′ end were used for reverse transcription mRNA. Following ligation of the oligomer 5′-GCTTGAATTCAAGC-3′ to the cDNA, DNA was digested with HindIII, resulting in clones containing an EcoRI site at the 5′ end and a HindIII site at the 3′ end. These cDNAs were ligated in the modified VR1012 plasmid that was digested with EcoRI and HindIII. Pools containing ∼50–200 bacteria were grown overnight and plasmid DNAs were isolated using the Wizard 9600 DNA purification system (Promega, Madison, WI). Pools of DNAs (100–200 ng) were transfected into COS cells along with the appropriate HLA cDNA (100 ng) or into the 293 embryonic kidney cell line that was stably transfected with HLA-A2 (293-A2) using lipofectamine (BRL, Gaithersburg, MD). Fifty thousand CTL or 2000–5000 CTL clones were mixed with 5 × 104 COS or 293 cells that were transfected with pools of cDNA library clones. After about 20 h, supernatants were harvested and the amount of IFN-γ or granulocyte-macrophage CSF was measured using ELISA as previously reported (4). Bacteria were transformed with cDNA pools from positive wells in the first screening, and plasmids containing a single cDNA were isolated and used for the second screening with the CTLs. After a second or third screening, cDNAs encoding melanoma Ags were sequenced using an ABI Prism 310 genetic analyzer with dye terminator cycle sequencing Kits (Perkin-Elmer, Foster City, CA). Sequences were compared with the GenBank database using the BLAST algorithm. The VR1012 or pcDNA3 plasmids containing truncated variants of the cDNA encoding melanoma Ags were generated by a PCR or a standard exonuclease III nested deletion technique as previously described (8, 10). The regions containing the epitopes were identified by testing recognition by TIL of COS or 293 cells transfected with the various cDNA fragments and the appropriate HLA cDNA. Candidate peptides from these regions were synthesized on the AMS 222 multiple peptide synthesizer (Gilson, Worthington, OH) using standard F-moc chemistry and were further purified on a R2 reverse HPLC column (PerSeptive Biosystem, Framingham, MA) as well as a C8 column (Vydac, Hesperia, CA) (>98% purity) using an acetonitrile gradient in water with 0.05% trifluoroacetic acid. The mw of the peptides were verified by mass spectrometry measurement. To assess peptide recognition by T cells, an IFN-γ or granulocyte-macrophage CSF release assay or a 51Cr release assay was performed using peptide pulsed indicator cells including HLA-A1-transfected COS cells, HLA-A3 transfected HMY-C1R cells and T2 cells as previously described (4, 6). A subline of TIL1388 was expanded using anti-CD3 mAb, allogeneic PBMC and allogeneic EBV-B cells. This TIL1388 recognized HLA-A1 allogeneic melanoma cell lines including Skmel23 as well as HLA-A1 transfected melanoma cell lines such as 624melA1, but did not recognize the HLA-A1 negative melanoma cell line 624mel or the HLA-A1 transfected embryonic kidney cell line 293A1, suggesting that it recognized one or more shared melanoma Ags in the context of HLA-A1 (Table I⇓; and Y.K., unpublished data). A cDNA library made from the highly pigmented melanoma cell line SKmel23 was screened with TIL1388 by transfecting COS cells with the cDNA pools (each containing 50 cDNAs) and HLA-A1 cDNA, and measuring IFN-γ production by TIL1388 when TIL and COS cells were mixed. After screening 1500 cDNA pools (∼75,000 cDNAs), one strong positive (15A7) and one weak positive pool was found. Individual cDNAs were isolated from positive pools and screened again with TIL1388. Seventy one of 160 cDNAs screened were positive for recognition by TIL1388. Four strongly positive cDNA clones were sequenced and all were found to be the same 782bp cDNA fragment derived from tyrosinase (Fig. 1⇓). TIL1388 recognized COS cells transfected with the purified 12F4 cDNA and an HLA-A1 cDNA (Table I⇓). Recognition of tyrosinase cDNA fragments by TIL1388. Tyrosinase cDNA fragments T4 and T7 were generated by exonuclease III digestion. The 12F4 clone was isolated following the screening of a cDNA library with TIL1388. TIL1388 recognized 12F4 and T4 transfectants but failed to recognize T7 transfectants. The TIL1388 epitope (amino acids 125–136) and a previously identified HLA-A1-restricted T cell epitope (Ref. 18) (amino acids 200–211) are underlined. To locate the region in tyrosinase encoding the epitope recognized by TIL1388, truncated cDNA fragments of various sizes were generated using the conventional exonuclease III deletion method, and the ability of COS cells that were transfected with these tyrosinase cDNA fragments and an HLA-A1 cDNA to stimulate TIL1388 was tested. The results of this analysis suggested that the epitopes were located between residue 122 and residue 149 (Fig. 1⇑). Peptides from this region conforming to the canonical HLA-A1 binding motif (9–12 mers, a negatively charged amino acid at or adjacent to the third position, and tyrosine at the C terminus) were synthesized (Table II⇓). The 11-mer peptide SSDYVIPIGTY (tyr:145-156) that contains aspartic acid at the third position and the 12-mer peptide ISSDYVIPIGTY (tyr:145- 156) containing an additional isoleucine at the N terminus, stimulated IFN-γ production by TIL1388 when the peptide pulsed HLA-A1 transfected COS cells were incubated with this TIL (Fig. 2⇓). The 11-mer peptide appeared to be recognized at a lower peptide concentration than the 12-mer peptide in repeated experiments. The peptide concentration of 1000 nM needed for recognition of the 11 mer is higher than that of most other epitopes. Lower concentrations of peptide could possibly be recognized when pulsed onto cells with suitable costimulatory molecules. It has previously been reported that several HLA-A1-restricted melanoma reactive CTL recognized the tyrosinase peptide KCDICTDEY (18). Replacement of the cysteine residue at the second position with alanine appeared to greatly enhance recognition, presumably by interfering with the formation of an internal disulfide bond. These peptides, however, were not recognized by TIL1388, as predicted by the results of the cDNA fragment experiments (data not shown). Two additional HLA-A1-restricted melanoma-reactive CTLs that were established in the Surgery Branch, National Caner Institute, did not recognize any of these tyrosinase peptides (data not shown). Recognition of tyrosinase epitopes by TIL1388. COS cells transiently transfected with HLA-A1 cDNA were incubated with peptides at the indicated concentration for 2 h and then TIL1388 was added at an responder:stimulator ratio (1:1) for 20 h, and IFN-γ release from TIL was measured using ELISA. Sublines of TIL1351 recognized the HLA-A3 allogeneic melanoma cell lines including 526mel and 624mel, and the HLA-A3-transfected melanoma cell line Skmel23A3, but did not recognize HLA-A3 negative melanoma cell lines including SKmel23 or HLA-A3-positive nonmelanoma cells, suggesting HLA-A3-restricted recognition of shared melanoma Ags (Table III⇓, Expt. 1; Y.K., unpublished data). A SKmel23 cDNA library was therefore screened with TIL1351 using the method described above. Approximately 50,000 cDNAs were screened and 16 positives were found in the first screening. Twelve positives were then found in the second screening using individual cDNAs from one of the positive pools (12G8). These clones were found to contain a 1940-bp cDNA insert encoding the melanosomal protein gp100 (Fig. 3⇓). TIL1351 recognized COS cells cotransfected with the purified 12G8 cDNA and an HLA-A3 cDNA (Table III⇓, Expt. 2). Recognition of gp100 cDNA fragments by TIL1351, TIL1383 clone 48 and clone 51, and TIL1200. The gp100 fragments D4 and B7 were generated by standard exonuclease III deletion, and the 12G8 and PTR fragments were isolated following the screening of cDNA libraries using TIL1351 and TIL1383 clone 51, respectively. TIL1351 recognized HLA-A3+ target cells transfected with B4, 12G8, and PTR transfectants but failed to recognize D4 transfectants. TIL1351 appears to recognize a second gp100 epitope between amino acids 195 and 413 in the context of HLA-A3 that has not been identified. The TIL1383 clones recognized HLA-A2+ target cells transfected with 12G8 and PRT, and TIL1200 recognized HLA-A2+ target cells transfected with each of the constructs. The TIL1351 epitope (amino acids 613–622), TIL1383 clone 48 and 51 epitope (amino acids 619–627), TIL1200 epitope (amino acids 639–647), and a previously identified HLA-A3-restricted T cell epitope (amino acids 17–25) are underlined. Several gp100 cDNA fragments made by exonuclease III deletion and PCR were tested to determine the location of the HLA-A3-restricted gp100 epitopes. Representative results are shown in Fig. 3⇑. TIL1351 recognized COS cells transfected with 12G8, B4, and PTR fragments, but did not recognize COS cells transfected with the D4 fragment, suggesting the existence of two epitopes, one located in the region beginning near residue 195 and ending with residue 413 and another in the overlapping region of the PTR and 12G8 fragments (residues 522–646) (Fig. 3⇑). 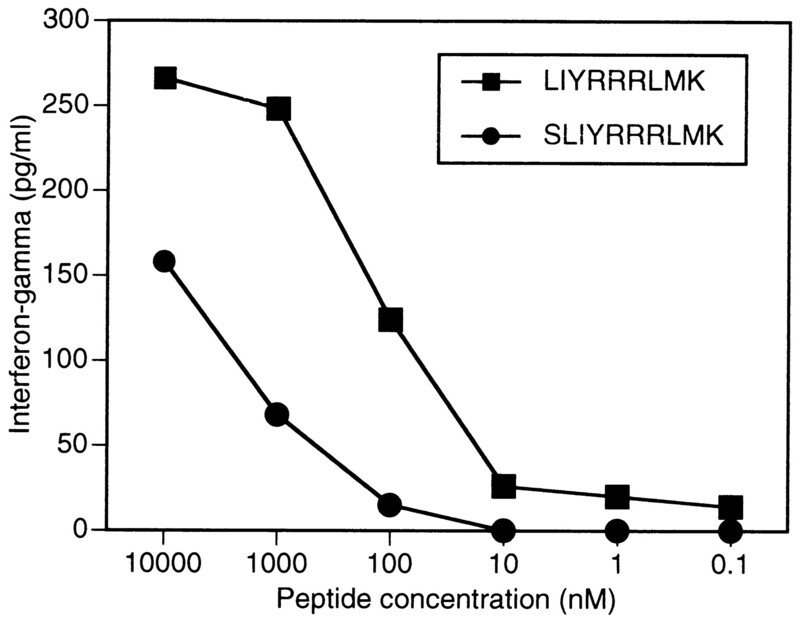 Peptides within these regions that conform to the canonical HLA-A3 binding motif (9–11 mer, peptides containing lysine, arginine, or tyrosine at the C terminus) were synthesized (Table II⇑) and tested for recognition by TIL1351. However, none of the synthetic peptides in the region between amino acids 195 and 413 were recognized. Between amino acids 522 and 646, two peptides, the 9-mer LIYRRRLMK (gp100:614–622) and the 10-mer SLIYRRRLMK (gp100:613–622), each containing the consensus HLA-A3 binding motif (hydrophobic amino acid, isoleucine or leucine at the second position and lysine at the C terminus) stimulated IFN-γ production by TIL1351 when peptide pulsed HLA-A3-transfected HMY-C1R plasmacytoma cell lines were incubated with TIL1351 (Fig. 3⇑ and 4⇓). The 9-mer peptide was recognized at a significantly lower concentration than the 10-mer peptide. Another HLA-A3-restricted melanoma CTL, TIL1086, that was established in the Surgery Branch, National Cancer Institute, did not recognize these gp100 peptides. The previously identified HLA-A3 binding gp100 epitope, ALLAVGATK, (22) was also not recognized by these two HLA-A3-restricted CTL (data not shown). Recognition of gp100 epitopes by TIL1351. HMY-C1R plasmacytoma cell line stably transfected with HLA-A3 cDNA was incubated with peptides at the indicated concentration for 2 h and then TIL1351 was added at an responder:stimulator ratio (1:1) for 20 h, and IFN-γ release from TIL was measured using ELISA. A cDNA library made from the 888mel melanoma cell line was initially screened using an HLA-A2-restricted T cell clone isolated from patient 1383, clone 51. Two hundred and eighty-eight cDNA pools, each containing 200 cDNA clones for a total of ∼50,000 cDNAs, were screened using clone 51, and 8 positive pools were isolated. Individual cDNA clones were isolated from 1 of the 8 positive pools, and a single cDNA clone isolated from this pool was shown to sensitize targets for recognition by the CTL clone 51, as well as a second CTL clone isolated from patient 1383, clone 48. This cDNA clone was found to encode the last 140 amino acids of the gp100 protein and was designated PTR (Fig. 3⇑). An assay was also conducted using a second HLA-A2-restricted CTL line, TIL1200, that had previously been shown to recognize the gp100:154–162 peptide (KTWGQYWQV) and the gp100:457–466 peptide (LLDGTATLRL) (8). The results demonstrated that TIL1200 also recognized one or more additional epitopes encoded by the PTR fragment (Table IV⇓). Previous studies of HLA-A2-restricted TIL that had been shown to recognize the full-length gp100 gene product had resulted in the identification of five peptide epitopes (7, 8). Since none of the known gp100 epitopes were located within the PTR fragment (amino acids 522–661), TIL1200 as well as the TIL1383 clones appeared to recognize one or more previously unidentified gp100 epitopes. 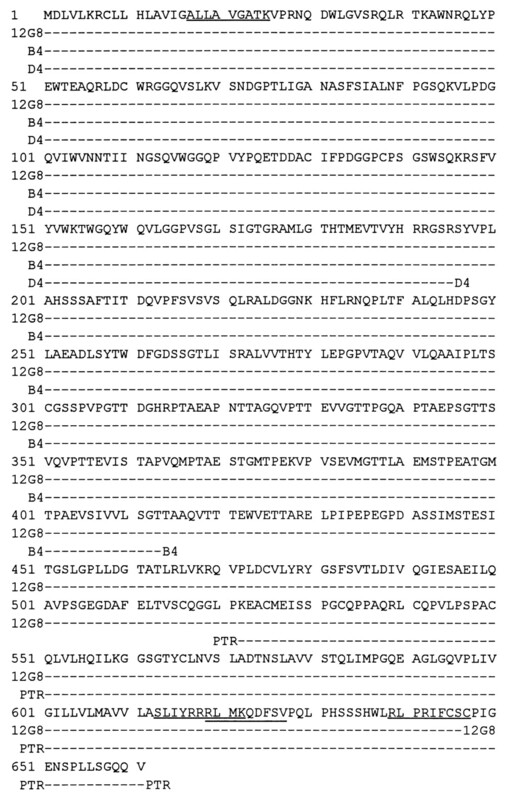 Eleven synthetic peptides encoded within this region that fit the HLA-A2 binding motif were then tested, and a single 9-amino acid peptide starting at amino acid position 619, RLMKQDFSV (gp100:619–627), was recognized by TIL1383 clone 48. This clone recognized T2 cells that had been pulsed with the gp100:619–627 peptide at a concentration as low as 1 pg/ml (data not shown). In the same experiment, TIL1200 was tested for recognition of the 11 peptides within this region (Table V⇓, Expt. 1). TIL1200 failed to recognize any of the 11 peptides; therefore, several additional peptides were synthesized that contained a conventional anchor residue at either the second or the last position in the peptide but not both positions. 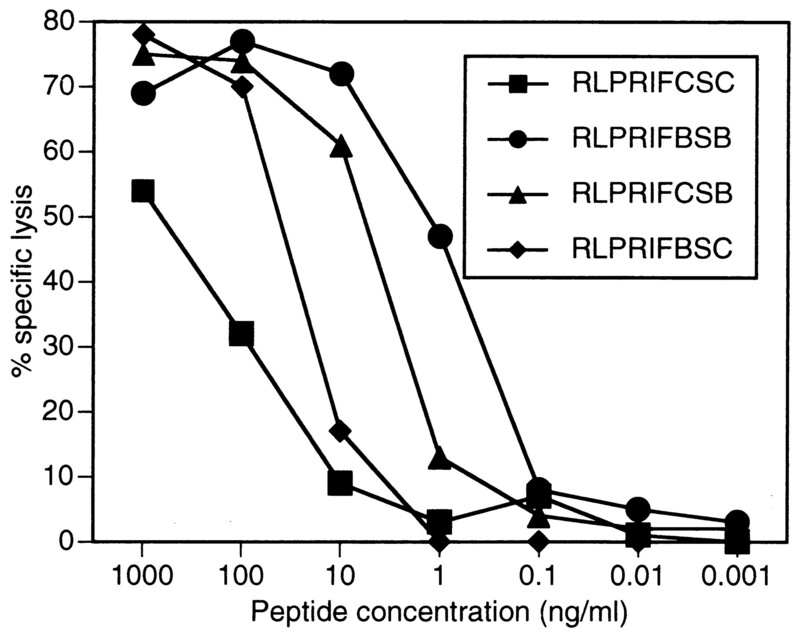 Screening of eight peptides that were synthesized within this region revealed that only one peptide, RLPRIFCSC (gp100:639–647), was recognized weakly when used to pulse T2 cells at 1 μg/ml (Table V⇓, Expt. 2). 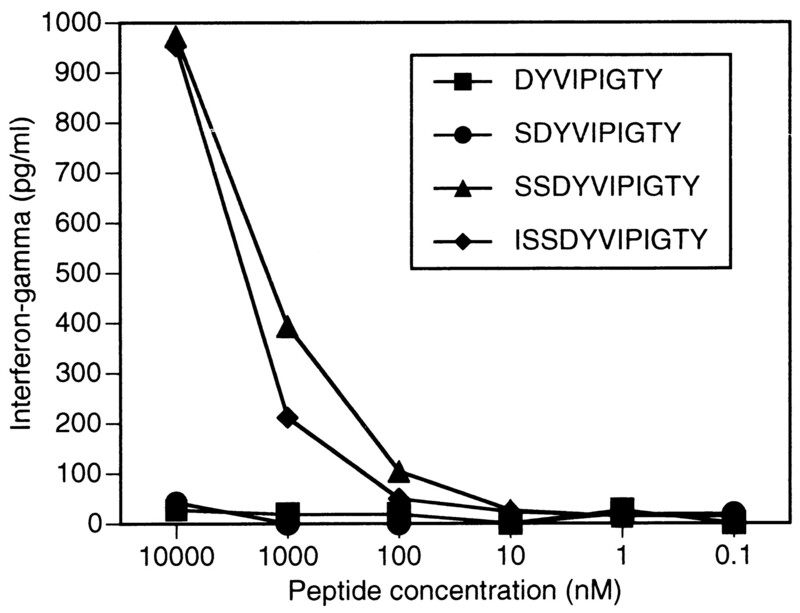 In other experiments stronger recognition of this peptide was observed (Table VI⇓). Clonal fluctuations in the bulk TIL1200 may be responsible for the variable degree of recognition of this peptide. This peptide contains an optimal leucine anchor residue at position 2 but contains a nonconsensus cysteine residue at the C-terminal anchor position. Recent findings suggest that some T cell epitopes may contain modified cysteine residues and suggest that these modifications may affect either the binding of these peptides to class I MHC molecules on their interaction with TCRs (18, 31). Therefore, analogues that contained an α-amino butyric acid group in place of the cysteine residues were synthesized. The α-amino butyric acid group side chain cannot be oxidized, but the size of the α-amino butyric acid side chain approximates that of a cysteine residue. Results of studies of peptides substituted at either one or both of the cysteine residues indicated that substitution at either site enhanced recognition, and that substitution of both sites resulted in further enhancement of T cell recognition over that seen with either of the single substitutions (Fig. 5⇓). These findings indicate that the oxidization of the native peptide may either interfere with binding to the HLA-A2 molecule or inhibit T cell recognition of the peptide MHC complex. Recognition of gp100 gp100:639–647 variants by TIL1200. T2 cells were pulsed with peptides at the indicated concentration for 1 h and then TIL1200 was added at an E:T ratio of 10:1 for 4 h, and the percent specific lysis of target cells was determined. B, α-amino butyric acid. The ability of additional HLA-A2-restricted TIL lines to recognize these newly identified gp100 peptides (gp100:619–627 and gp100:639–647) was then examined in a cytokine release assay (Table VI⇑). TIL1200 was the only TIL that appeared to recognize gp100:639–647, and none of the bulk TIL lines recognized gp100:619–627. Additional assays demonstrated that six additional TIL including a bulk, uncloned TIL line from patient 1383 failed to recognize either of these gp100 epitopes (data not shown). The only line that demonstrated recognition of either of these peptides at the bulk level was TIL1200, which recognized the gp100:639–647 peptide. Thus, these peptides, in contrast to the gp100:154–162, 209–217, and 280–288 peptides that were able to be recognized by TIL from many patients (8), do not appear to represent the predominant specificities recognized by HLA-A2-restricted, gp100-reactive T cells. A variety of human melanoma Ags recognized by T cells have recently been identified by various methods including DNA cloning, peptide isolation, and T cell induction against candidate proteins. One major group of identified Ags are melanosomal proteins that are present in cytoplasmic organella, melanosomes, where melanin pigments are synthesized. Five melanosomal proteins, tyrosinase, gp100, MART-1/Melan-A, TRP1, and TRP2, have previously been found to be recognized by CTL in the context of a variety of HLA alleles (1, 2, 3). Peptide epitopes derived from these Ags, including the four epitopes that were identified in this study are shown in Table VII⇓. Recent clinical trials have indicated that T cell responses against melanosomal proteins may be involved in in vivo melanoma regression in some patients. Among 21 patients to whom TIL were administered along with IL-2, a significant correlation was observed between clinical response and recognition by TIL of the gp100 Ag (p = 0.024) (8, 33). In a recent phase I clinical trial of active immunization using the gp100:209–217(210 M) peptide which contains a threonine to methionine substitution at position 2 and binds with a 10-fold higher affinity than the unmodified peptide to a HLA-A*0201, in combination with IL-2, a 42% objective response rate has been observed (16). In a clinical trial using tyrosinase, MART-1/Melan-A, and gp100 peptides, an association between the progression of tumor metastases and loss or down-regulation of Ag expression has been observed (15). In addition, a significant correlation between tumor regression and the development of skin depigmentation resulting from melanocyte destruction was observed after IL-2-based immunotherapies in melanoma patients in the Surgery Branch, National Cancer Institute (34). The findings suggest that T cell responses against melanocyte-specific Ags such as melanosomal proteins may play a role in the in vivo regression of tumors. Thus, the identification of multiple epitopes of these known melanosomal Ags presented by frequently expressed HLA molecules including HLA-A1, HLA-A2, and HLA-A3 may facilitate the development of peptide based treatments for patients with diverse HLA types. In this study, four melanoma reactive CTL derived from TIL were found to recognize previously unidentified epitopes from tyrosinase and gp100. One tyrosinase peptide, SSDYVIPIGTY (tyr:146-156), was recognized in the context of HLA-A1, one gp100 peptide, SLIYRRRLMK (gp100:613–622), was recognized in the context of HLA-3, and two gp100 peptides, RLMKQDFSV (gp100:619–627) and RLPRIFCSC (gp100:639–647), were recognized in the context of HLA-A2. It is important to identify the natural epitope recognized by these T cells, since this peptide would presumably represent a better immunogen. The overlapping 11-mer and 12-mer peptides recognized by the HLA-A1-restricted, tyrosinase reactive T cells, and 12-mer peptides SSDYVIPIGTY (tyr:146-156) and ISSDYVIPIGTY (tyr:145-156), were both recognized when used to sensitize targets, but the 11 mer was always recognized at slightly lower peptide concentrations, suggesting that the 11-mer peptide may represent the naturally processed peptide. Biochemical studies of peptides that have been eluted from HLA-A1 molecules present on melanoma cells should be conducted to verify this hypothesis, since the vast majority of all the peptides that have been identified on human class I MHC molecules are either 9 or 10 amino acids in length (6, 8, 35, 36, 37, 38). An HLA-A3-restricted TIL recognized the gp100 9-mer LIYRRRLMK (gp100:614–622) at a 100-fold lower concentration than the 10-mer peptide SLIYRRRLMK (gp100:613–622), suggesting that the 9 mer is likely to be the natural epitope expressed on the tumor cell surface. Both peptides conform to the HLA-A3 binding motif, which consists of hydrophobic amino acids, generally leucine or isoleucine, at position 2 and a positively charged lysine residue at the C terminus. The tyr:146-156 peptide was recognized by one of three HLA-A1-restricted TIL, and the gp100:613–622 peptide was recognized by one of two HLA-A3-restricted TIL that were shown to respond to shared melanoma Ags. The three HLA-A1-restricted CTL, as well as the two HLA-A3-restricted TIL, failed to recognize epitopes of tyrosinase or gp100 previously shown to be recognized by HLA-A1- or -A3-restricted CTL. In a previous report by others, the tyrosinase peptide KCDICTDEY (tyr:243-251) was recognized by five of six HLA-A1-restricted CTL lines (18). It is not clear what is responsible for this discrepancy although the CTL assayed in the previous report were generated by repetitive stimulation of PBL with autologous tumor, whereas TIL were examined in this report. The gp100 epitope RLMKQDFSV (gp100:619–627) that was shown to be recognized by HLA-A2-restricted CTL may represent a naturally processed epitope, since T cell clones reactive with this peptide could recognize target cells pulsed with as little as 1 pg/ml of this peptide. In a previous report, several peptides that were identified based upon their relatively high binding affinity for HLA-A2 and used for sensitization of PBL from HLA-A2-positive normal donors, and one of the peptides that was utilized for these studies was gp100:619–627 (38). Peptide-reactive CTL that were generated using this peptide that only demonstrated minimal tumor reactivity. Only a limited number of normal donors were examined in this report, however, and it is possible that sensitizations conducted either in additional donors or melanoma patients could have resulted in the generation of T cells with clear tumor reactivity. It should be emphasized that the gp100:6 19–627 epitope was identified using a TIL clone after in vitro stimulation with HLA-A2-matched melanomas and thus it may not be as immunogenic as epitopes recognized by bulk TIL populations. A second previously unidentified peptide epitope from gp100, RLPRIFCSC (gp100:639–647), was found to be recognized by the HLA-A2-restricted TIL1200 cell line. Peptide titration studies demonstrated that concentrations of 100 ng/ml or greater were needed for efficient recognition of this peptide by TIL1200. Additional peptides were then synthesized that contained substitutions of the cysteine residues in this peptide with α-amino-butyric acid, which would prevent the formation of disulfide bonds either with the homologous peptide or other compounds present in tissue culture medium such as cystine and glutathione through disulfide exchange. The results indicate that single substitutions enhanced T cell recognition, and that substitution of both cysteine residues further enhanced recognition. Modified peptides containing substitutions of alanine or valine for the cysteine residues in gp100:639–647 also appeared to enhance T cell recognition of this peptide (data not shown). Thus, it appears that the natural epitope may be a peptide containing unmodified cysteine residues. Binding of the peptide to the MHC molecule in the endoplasmic reticulum may prevent the modification of the cysteine residues at positions 7 and 9 in gp100:639–647. Peptide epitopes containing cysteine residues have been characterized in two recent reports. In one report, two HLA-A2-restricted, two H-Y-specific T cell clones were shown to recognize the peptide FIDSYICQV (31). One clone appeared to recognize a modified peptide containing a second cysteine linked by a disulfide bond to the cysteine at position 7 of this peptide. The natural peptide recognized by the second T cell clone was not identified, but appeared to be distinct from this peptide and may contain additional modifications. As mentioned above, the tyrosinase peptide KCDICTDEY was also shown to be recognized by HLA-A1-restricted, tumor-reactive T cells (18). Substitution of either serine or alanine for the cysteine residue at the second position enhanced T cell reactivity, presumably by interfering with formation of an inter or intrachain disulfide bond. Substitution of the cysteine at position 5 with either or these residues, however, interfered with recognition, indicating that formation of a disulfide bond at this position might be involved with the generation of the T cell epitope. These results provide evidence that peptides containing both modified and unmodified cysteine residues can bind to class I MHC molecules. These observations have important implications for use of synthetic peptides containing cysteines in peptide-based immunotherapies for patients with cancer. In some cases, the substitution of amino acids that contain side chains of similar structures to cysteine such as α-amino-butyric acid, alanine, or serine may augment the immunogenicity of these peptides. In other cases, deliberate cysteinylation of a cysteine residue may be conducted to enhance the immunogenicity of peptides that appear to be expressed on the cell surface in a modified form. In summary, four new epitopes in the melanosomal proteins tyrosinase and gp100 were shown to be recognized by TIL. These peptides were recognized in the context of the HLA-A1, -A2, and -A3 haplotypes, which are expressed in 26%, 49%, and 25% of the Caucasian population, respectively. One of the gp100 epitopes appears to contain two cysteine residues, and results demonstrating that substitution of amino acids at these positions that cannot be modified by cysteinylation can enhance the antigenicity of this peptide suggest that the immunogenicity of this peptide can likewise be enhanced by these modifications. These newly identified peptides, which are derived from widely expressed melanosomal proteins, can be used for the further development of peptide-based immunotherapies for patients with melanoma. ↵1 Current address: Division of Cellular Signaling, Institute for Advanced Medical Research, Keio University School of Medicine, 35 Shinano-machi, Shinjuku-ku, Tokyo 160-8582, Japan. ↵3 Abbreviation used in this paper: TIL, tumor infiltrating lymphocytes. Robbins, P. F., M. El-Gamil, Y. F. Li, E. Fitzgerald, Y. Kawakami, and S. A. Rosenberg. 1997. The intronic region of an incompletely spliced gp100 gene transcript encodes an epitope recognized by melanoma reactive tumor infiltrating lymphocytes. J. Immunol., In press. Kawakami, Y., N. Dang, X. Wang, J. Tupesis, P. F. Robbins, R. F. Wang, J. R. Wunderlich, J. R. Yannelli, and S. A. Rosenberg. 1998. Recognition of shared antigens in association with major HLA-A alleles by tumor infiltrating T lymphocytes from 123 patients with melanoma. J. Immunother. In press.